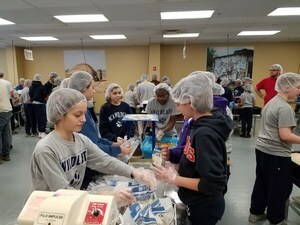 NCA Middle School students took a special service field trip to Feed My Starving Children in Libertyville. They packed 196 boxes, which will provide 42,336 meals to feed 116 children for one year! NCA seventh and eighth graders took a service field trip to Feed My Starving Children in Libertyville. Feed My Starving Children is a Christian non-profit organization that coordinates the packaging and distribution of food to people in developing nations. NCA students packed 196 boxes, which will provide 42,336 meals to feed 116 children for one year!